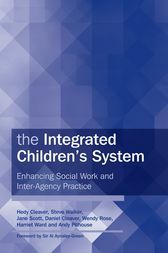 The Integrated Children's System (ICS) was developed to support effective practice with children and families and improve decision making and planning for children in need. This book outlines what the ICS is and how it works, and assesses the effectiveness of a number of pilot studies, offering guidance for others using and implementing the system, which is being rolled out nationally. Part of the Government's long term programme to improve outcomes and life chances for children, the system provides a more structured and systematic approach by integrating the processes of working with children in need from the point of first contact through to the final review. The Integrated Children's System is vital reading for policymakers, social care managers, social care practitioners and those responsible for implementing the system. Hedy Cleaver is an emeritus professor at Royal Holloway, University of London. Steve Walker is Principal Consultant for children and young people at the Improvement and Development Agency for Local Government (IDEA). Jane Scott is a member of the Centre for Child and Family Research and Research Fellow at Loughborough University. Daniel Cleaver is an independent academic with a background in pure and social sciences. Wendy Rose is a senior research fellow at the Open University. Harriet Ward is Director of the Centre for Child and Family Research and a professor at Loughborough University. Andy Pithouse is Professor of Social Research at the School of Social Sciences, Cardiff University.